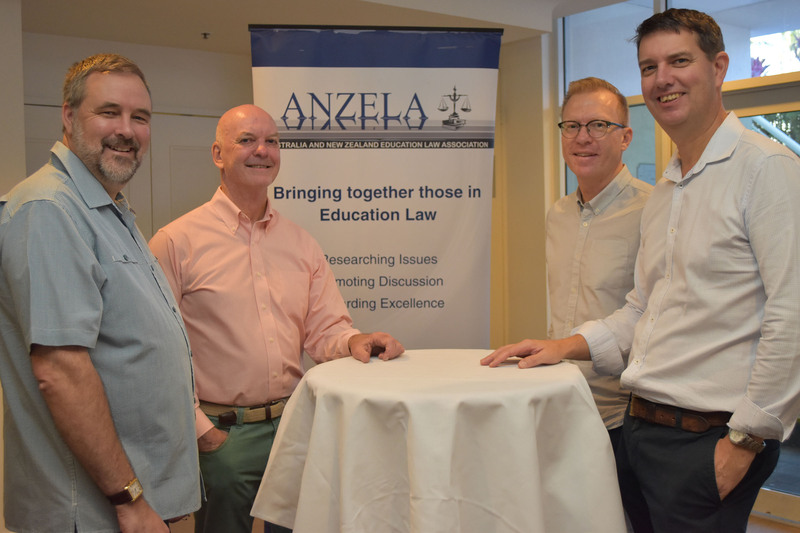 A broad range of timely topics about education law have been undergoing detailed discussion at the Australia New Zealand Education Law Association Ltd (ANZELA) international conference in Cairns this week. The conference theme explores new developments in education and law, with an emphasis on innovative ways of meeting traditional challenges and the needs of regional communities. L-R: Alan Knowsley (Director NZ Chapter, ANZELA), John Ryan (Director, Queensland College of Teachers), Jason Newman (National Vice President, ANZELA and Conference Convener), Tom O’Donnell (Director of Student Wellbeing and Diversity, CES). “The nature of the school environment is rapidly changing with increasing legal and community expectations,” said ANZELA National Vice President and Conference Convener, Mr Jason Newman. “A range of challenges are of growing interest to educators including responsibilities around modern technology use,” he said. Technology-related challenges such as how students engage online, inside and outside of school, is an example of a topic that escalates the need for Principals and their staff to ensure they are up to date with their legal obligations. Another challenge is the lack of student understanding about how to become active members of political life. The connection between the legal obligations of educators, and what is taught in the classroom, is becoming more apparent. More detail of the topics covered at the conference are available in the Program at http://www.anzela.edu.au/. Principals, teachers, lawyers, union representatives, academics, government and education interest groups constitute the 114 delegates who have travelled from around Australia, New Zealand, South Africa and the USA. They all seek to engage in discussion and gain an understanding of related legal obligations and how they contribute to the success of their schools, the children they educate, and their communities. By holding the ANZELA Conference in Cairns, local and regional educators from Far North Queensland have had the opportunity to more easily attend whilst being involved in the development of content for the conference program. “Local elements have included a Welcome to Country, local involvement in preparation and delivery, and major sponsorship, which are all important to us,” said Mr Newman. The conference has never been this far north since its establishment in 1991. Cairns Catholic Education is a major sponsor of the event. Australia & New Zealand Education Law Association (ANZELA) was established in 1991 with the aim of bringing together academics, legal practitioners, educators and others who have an association with and/or interest in Education Law and legal issues affecting education. ANZELA aims to promote and encourage research, study, discussion, writing and/or dissemination of information about issues on laws relating to education. For more information including what was covered on the conference program and future events, go to http://www.anzela.edu.au/.